Thanks to composer Bartok, we have ethnomusicology. The whole concept of “ethnomusicology” can be attributed to Bela Bartok, the Hungarian composer who travelled with fellow composer Zoltan Kodaly to the countryside to collect and research Magyar folk melodies. He schlepped a heavy phonograph everywhere to record the villagers singing these tunes. 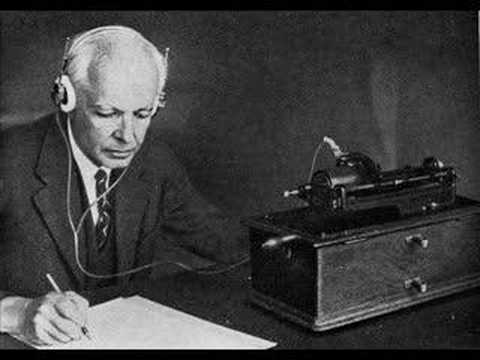 Bartok incorporated these melodies into his own works, which also drew upon the classical tradition and strong elements of modernism. He also wove into his works the folk music of Hungary, Romania, Bulgaria, Moldavia, Algeria, and Turkey. Some of his works sounds modern even by today’s standards; others, like rustic dance tunes. Bartok emigrated to the United States in 1940 to escape the war. He was acknowledged not so much for his compositions but for his work as a pianist, ethnomusicologist, and teacher. His legacy lives on in his works for piano, strings, and orchestra. He wrote terrific studies and dance pieces for piano, full of rhythmic punch and attractive folk melodies that are fun to play for kids and adults alike. Here’s Helene Grimaud playing Bartok’s Romanian Dances. This is a nice double memory for me – I took Ms. Grimaud on her media rounds in my former life as a publicist. I was nervous as she is so French- sophisticated, and I am … not. She was lovely. Also, I learned these pieces for my Royal Conservatory of Music grade 10 exam. My favourite is the third piece, “Stamping Dance”. I imagine dancers gently stamping in a circle, playing finger cymbals. Bela Bartok was born March 25, 1881 in Austria-Hungary (now Romania) and died September 26, 1945, in New York City, US.